Who are we and where did Digger’s Diner come from? Digger’s Diner was founded on February 1, 1994 by my Aunt and Uncle, Kathy and Dave (AKA Digger Dave). They came up with the name because Digger is just that…a grave digger at the local cemetery. Aunt Kathy had a dream of owning her own restaurant and she made it come true. She quickly became even more a part of her hometown community of Concord. In July 1998, because of health reasons, Aunt Kathy passed the Digger’s torch to me, DiAnn and my husband Jon. I was very excited to carry on her legacy at Digger’s. Lucky for all of us, she didn’t stay gone long and is still an integral part of Digger’s as the General Manager of our Concord location, and Digger Dave continues to be our #1 P/R man with the corny jokes that don’t stop. When we took the reins, I was a college graduate and book-smart, but was a little shy, so I was a little nervous about my new life, but not for long! The Digger’s family -employees and customers- quickly cured me of any shyness and gave me the incredible gift of many, many new friends and opportunity to give back to my church and my hometown of Concord as well. Now, 12 years and 2 terrific kids later we have moved to another wonderful family community and are excited to expand the Digger’s circle of friends and family (and good food) to our new community! With Aunt Kathy’s 4 years and our 12 years of ownership Digger’s has been around 16 years and we’re ready to expand and move forward. Digger’s has won “Best Burger” in the Concord Transcript two years and we have won several other contests on the radio. We then shocked the world, well... as least Brentwood by winning the coveted title of “Best Burgers in Town the very first year we opened” Not only have we repeated the title in this our second year, we were also voted “Best Breakfast”. So watch out Hayward, here we come! And we are determined to provide the very best food in an environment that makes you feel better when you leave than you felt when you arrived all at the lowest prices. So, thank you for stopping by Digger’s and welcome to our extended Digger’s family. 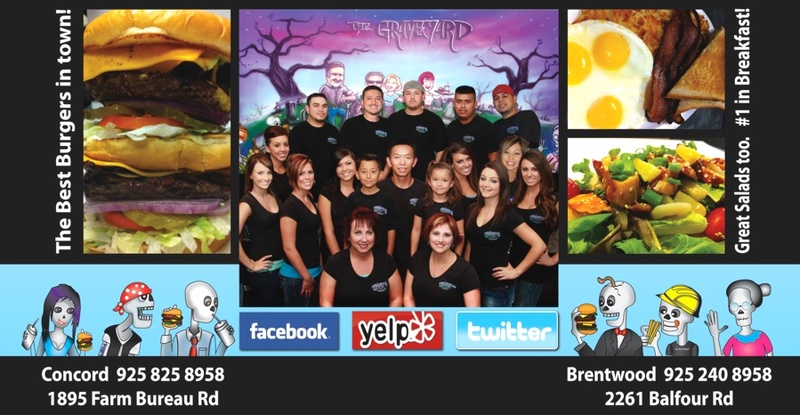 Diggers offers a clean, friendly, affordable and “delicious” dining experience from our family to yours. Property of Digger’s Diner CA. All rights reserved.